The Simon Says Stamp Flickr Challenge #14 requires you to make a card in the clean and simple style. This means one layer, effective use of white space and very few embellishments. I decide to make a bright and cheery graphic-styled card. It was fun because the stamp images were stamped randomly and I really like the way it turned out. To begin, I went through my stamps and looked for any kind of circles or dots. 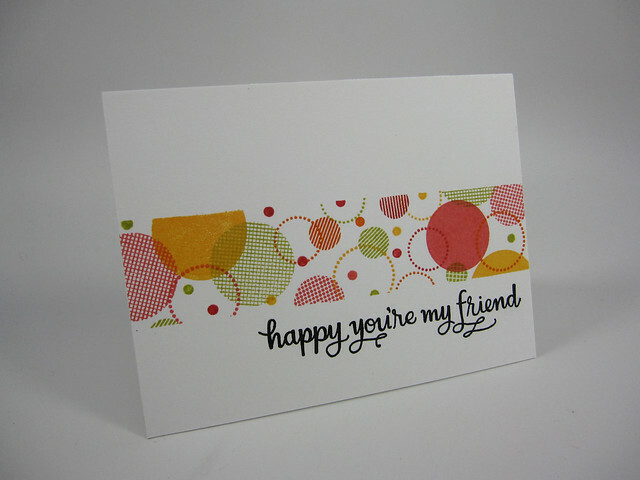 I wound up with several dotted, patterned and solid circles for the card. I chose bright ink colors that would pop agains the white cardstock. The colors were kind of complements to each other. I have read that colors on the opposite sides of the color wheel cause tension or energy when viewed and I wanted that kind of energy for the card. The orange-reds, orange-yellows and red kind of complement the chartreuse green (yellow-green). I then masked my card front with 3-M, 2-inch wided post-it tape and left an open strip on the card front about 1.25″ wide across the length of the card. The unmasked area is the area in which I stamped my circles. I started with large circles first and stamped them randomly on the card. I then filled in the other areas with the smaller circles and used a dot stamp to fill in any areas I thought looked empty. There was no real method to the ink colors I used for each of the circle. The only thing I was careful to try to do was not concentrate a color in one particular area. I pleased with the random look of the card. I used a long sentiment that went across the card front just like the dotted area. Stamps: Simon Says Stamp: Lots of Dots, Sunnier Days, and Love This; My Favorite Things: Bokeh Builder stamp set; Simon Says Stamp: On My Mind (stamp set in SSS March, 2015 card kit). Inks: Papertrey Ink: Orange Zest, Summer Sunrise, Berry Sorbet, Pure Poppy, and Simple Chartreuse; Versamark Black Onyn pigment ink. Cardstock: Neenah Solar White 110 lb. cardstock. Other: 3-M 2-inch Post-It tape.